3 Inch Rear Bolt-On DeFender Flares (Steel) for Jeep Wrangler YJ 1987-1996. DeFender Flares are designed to match Poison Spyders front DeFenders. These bolt-on DeFender Flares may be added to your existing Poison Spyder Crusher Corners or competitors Full corner armor. Fabricated entirely of 3/16 inch plate steel, DeFender Flares are a tubeless design, meaning they are Not constructed with the thinner wall (.120) tubing outer rail, as traditional tube fenders and flares are built. DeFender Flares feature a sturdy outer edge formed of 3/16 inch plate, with a Full under-side return for strength. This bolt-on version of the DeFender Flare features a CNC laser cut 3/16 inch mounting plate with countersunk holes so the bolt heads are flush. Available in steel or aluminum, Rear Bolt-On DeFender Flares make it possible to use a variety of different corner armor and flare combinations. For example, those wishing to save weight but still needing the toughness of a steel rub rail, may opt to install aluminum Crusher Corners with steel DeFender Flares. They also make it possible to retrofit steel flares on to existing flare-less corner guards without welding. The bolt pattern matches the Stock TJ flare bolt pattern, meaning they will bolt to our Stock configuration TJ Crusher Corners without drilling. While they are designed to fit the larger TJ style wheel opening, these may also be used on YJs and CJs, where a larger wheel opening and flare is desired. 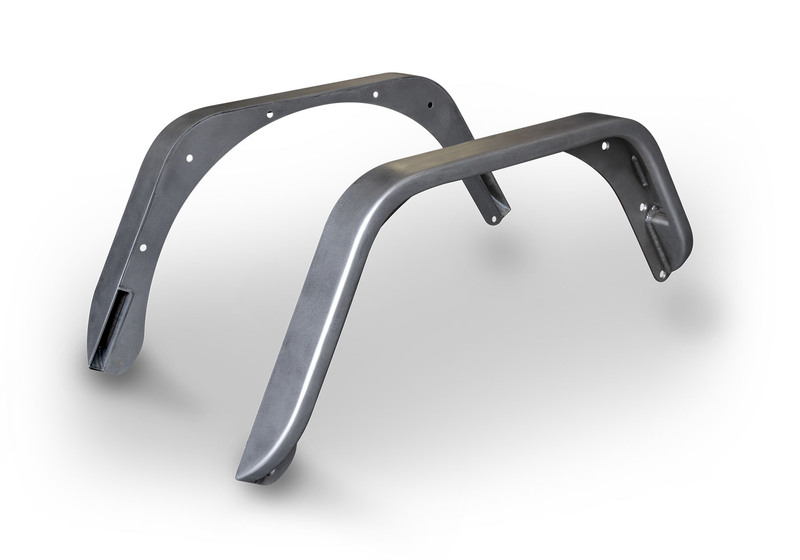 While these may be mounted directly to the Jeep sheet metal body without any corner protector, we do Not recommend doing so. We recommend bolting it to Full corner protectors that are at least 1/8 inch thick, and preferably 3/16 inch.